There is something about rotisserie chicken. I love it. Maybe it’s that you don’t have to do any cooking. Or maybe that it’s never burned and always perfectly flavored. Or perhaps it’s the fact that it warm, tender and juicy and the only thing I eat off the bone. Whatever it is, it’s amazing. My favorite way to eat a fresh rotisserie chicken is on salad with a little blueberry goat cheese and some type of fruit. A drizzle of Trader Joe’s Champagne dressing makes it perfect. But sometimes you need to change it up. Especially if you are having company and want to put something presentable on the table – A half devoured chicken doesn’t appeal to anyone. That is where this salad comes into play. It’s perfect for weekday lunches, a dinner for a busy family, a shower luncheon or just a way to use up leftover rotisserie chicken. In a small bowl, mix yogurt and mayo together. Then mix chopped chicken in a large bowl along with celery, grapes, pecans, salt and pepper. Add mayo/yogurt and mix to combine. 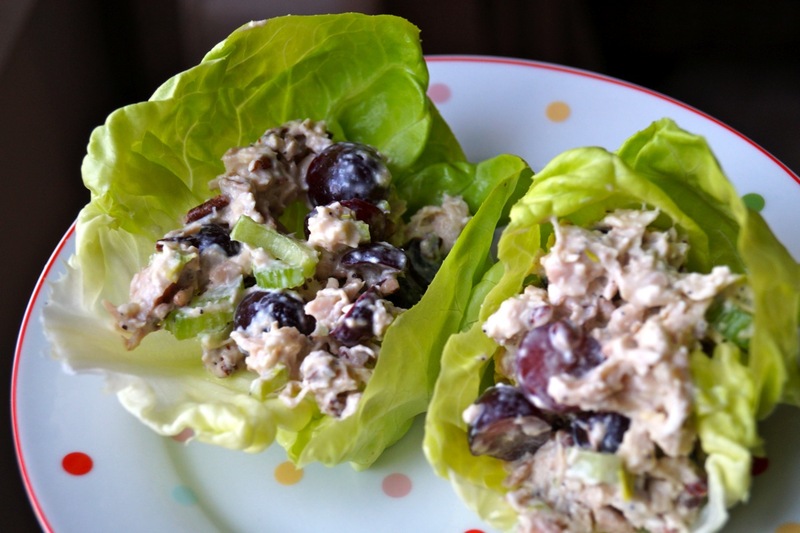 Serve in lettuce cups, on bread or a fresh croissant!